1" Grasshopper USB 3.0 NIR Camera - SolarChat! Hello and welcome to the site, I'm sure someone on here can help with your questions. I would be very concerned that the chip is CMOS, you may suffer all sorts of strange matrix patterns in the image. I think Reniems has this problem with a PGR CMOS he just bought. Have you seen any solar images taken with this camera chip? it is very important! Anyone know any alternatives to CMOSIS CMV4000 a reasonable price? I would also worry about a CMOS sensor. Many of them tend to cause problems with Newton's Rings - I have a ZWOASI120 camera which is great for moon and planets but not my choice for solar work as it produces horrible NRs when used with a Barlow for Ha work. Some people have solved the problem by using tilt adaptors and flats but it is a hassle. I also get the pattern noise at high gain with this camera and it does look a bit like the problem Reniems has has with his PG. I use the PG Grasshopper - GS3-U3-28S5M-C with the CCD sensor Sony ICX674. Several other people on here (Alexandra, Pedro and Swisswalter for example) use the same model and get very good results BUT it is expensive and needs a pretty powerful computer to deal with the high data flow. I get a full solar disc with my 80mm scope but need to do a 2 pane mosaic with my 100mm. Thank you very much for your comments, are extremely helpful to draw conclusions, what I'm seeing is that the sensor size I like 1" if I have to scrap the CMOS'm going to more than double in price equivalent CCD. All that madness telling me confirms my experience with the DMK72 is identical to the photo you send me ASI120 banding effect with both CMOS sensor. I spoke to the Point Gray rep about the NIR sensor a few months ago and they have not had a lot of experience using it for astronomy purposes, but the few who have tried it did not give it a good review. I am not sure what targets they were imaging, but I was interested in the high QE in the IR for narrow band images in methane (889nm) and other IR Pass filters of the gas giants. For this use I don't need the large array offered by the chip so I am holding off. I believe they do offer a return option of some sort if the camera does not perform to expectations, but I think I will wait until Jupiter is better placed to experiment. There are a number of cameras (chips) that work well for solar, but the full disk is a challenge unless you spend a lot of money. 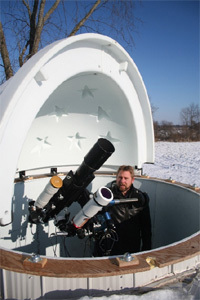 another option is to use a telecompressor to get the full disk image (or mosaic), and run the scope at longer focal lengths for hi-resolution fields around the areas of interest. Full disk at 1,000mm focal length without mosaics will take some $$$...the ICX694 chips will give a 42'x32' FOV which will have the disk filling the narrow axis when the solar disk is at its largest apparent diameter. Next up looks to be the ICX814, but even it only gives 34' on the narrow side (smaller pixels and better resolution). The IMX174 has had good results, and would give you a 38'x34' FOV...only require a 2 frame mosaic to do the full disk, and the price is far more reasonable. I see that the camera based on CMOSIS CMV4000 carries a global shutter, it will be favorable to minimize newton rings? I cannot address the rolling vs global shutter, though I have read somewhere that global may be more astronomy friendly, though I cannot remember where I read that...take it as you will. I do not think that we can paint all CMOS based sensor with the same brush...the IMX174's are reportedly good, and I know one fellow here who has had very good results with the VITA1300 based camera. Have to see the performance to know. I have an Infinity 2-1M camera, and it performed quite well for me (since moved to an ICX674 based camera). I do get some newton rings with this one, but not on a regular basis and seem to be worse with my Daystar quantum filter vs the Lunt etalons...I can usually flat field them out. Hi Jose...thanks for introducing yourself. Choosing a camera is always a challenge...there are many options and we usually have to make some compromises to get most of the features we want. I think that the banding can be present in most any camera (CCD or CMOS) when use don such narrow band filters that we use for Ha and CaK. The 'tilt' option is one way to correct it, and flat fields can also help. I hope you can find one that meets your needs. Thanks for posting the adapter link...I was hoping to find it when I got home. The tilt adjust device would be a lot handier if it were equipped with a C thread on the camera side!!! Agreed Brian. They do seem to produce a few different models but the T2 fits the ZWO cameras and there are plenty of T2 to pretty much anything adapters out there.